A few years ago, two former Sundance chefs—Joseph McRae and Colton Soelberg—opened Pizzeria 712 in Orem. For a community swimming in franchises and chain restaurants, this was the exact opposite: not another cookie-cutter pizza chain, but a one-off dishing up wood-fired pies with toppings such as speck, roasted cauliflower, Meyer lemon gremolata, and sides that included things like Brussels sprouts, French green lentils and pork belly. Little Caesars, this ain’t. With Communal restaurant—located in the heart of downtown Provo—McRae and Soelberg have upped the ante by creating another eatery that not only thumbs its nose at the average American palate, but even goes so far as to challenge our expectations regarding what restaurant dining consists of. It’s not just that the food at Communal is anything but standard; true to its name, eating at Communal is often a truly communal experience. The centerpiece of this very appealing restaurant is a long communal table, where you might find yourself supping next to total strangers—strangers who might become friends by the end of the meal. This type of dining isn’t for everyone. 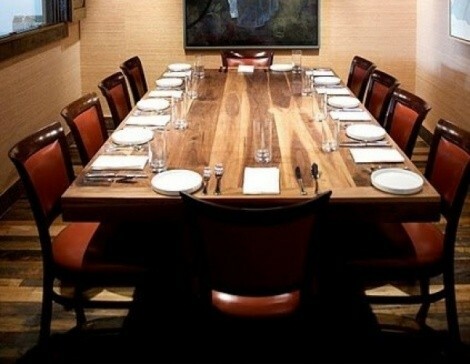 Looking at online reviews of Communal, the most frequent complaint is about the communal table. Not that it’s the only option; there are individual tables at Communal, as well as counter seats where you can get a front-row view of the chefs working in the open kitchen. The kitchen is so intertwined with the main dining room, in fact, that you’ll get whiffs of searing meats and roasting veggies during your meal—a sensory bonus. Anyway, if the possibility of breaking bread with strangers isn’t your thing, don’t worry; I’m sure there’s an Applebee’s or Chili’s within walking distance. Brunch on Saturdays is wildly popular. Don’t show up without reservations, like we did. I waltzed in thinking “Who does brunch in Utah County?” Well, everyone, apparently—and all of them at Communal, it seems. Thankfully, a very accommodating hostess asked us to return in half an hour and she’d have a table for us, which she did. The brunch menu changes frequently, but you can always get a bowl of steel-cut oatmeal ($7) with bananas, toasted walnuts, brown sugar and milk. Unfortunately, the milk was curdled when it arrived, having been poured into a molten-hot ceramic milk dispenser that had apparently just come out of the dishwasher. An outstanding brunch selection is the poached Clifford Farm egg with glistening chanterelles and spinach on a bed of grits ($12). The homemade biscuits, too, are outrageously good, although I found the sausage gravy a bit bland. Unfortunately, Communal is one of those places where tables aren’t supplied with salt and pepper; my sausage gravy would have vastly benefited from a hefty dose of black pepper. I liked the homemade sausage, too, but felt that $3.50 for a side order of sausage was a tad exorbitant. Dinner began with a shared starter of Rockhill gouda-stuffed pierogies, served with a dollop of rosemary applesauce, creme fraiche, caramelized sweet onion and chive oil. It tasted just fine, but for $9 I’d expect more than three smallish pierogies, which went rapidly. But, there was wine to sip (yes, wine in Utah County!) as we awaited the arrival of our entrees and enjoyed the jazzy tunes that wafted through the restaurant—tunes that my wife pointed out were not Christmas songs, blessedly. There is a nice little beer selection at Communal, including bottles of Pilsner Urquell, AVBC Oatmeal Stout, Rogue White Crane Ale, Ayinger Oktoberfest and others. The wine selection is limited, however, especially by the glass. I suspect that wine sales don’t make up a large percentage of a restaurant’s profits in Provo, which is probably why there are only three wine-by-the-glass options available: one Chardonnay, a Rosé and a Cabernet Sauvignon. I’m sure it’s problematic for a restaurant this size, in a community where most people don’t drink, to tie up storage space and capital with a large wine inventory. There are some 20 wines available by the bottle, however, or you could just bring your own. Getting back to the food, an absolutely perfectly cooked pan-roasted salmon filet was fantastic, almost ethereal, adorned by nothing more than a light lemon-thyme vinaigrette and wilted arugula ($23). Menu items at Communal are a la carte, which means prices can escalate rapidly when adding sides ($5-$7) to entrees priced from $17 to $23. However, the sides are generously portioned and easily shared by two or more people. I loved the crisp, thinly sliced, sautéed Brussels sprouts, with oven-roasted onions and crunchy bacon nuggets ($6). Another excellent side dish is pumpkin farro ($7). Frankly, it looked like gruel, but tasted wonderful: farro with caramelized sweet onions and roasted sweetmeat squash. Nearly every dish at Communal features a locally produced, artisan food product of some sort. The sirloin comes from Pleasant Creek Ranch, squash from Cook’s Farm, chocolate is from Amano and so on. As at Pizzeria 712, the owners and chefs at Communal are committed to using local, sustainable products whenever possible. A large hunk of braised pork shoulder ($17) from Christiansen Farm was a thing of beauty. This is the type of food I just adore: not a brain-twisting, convoluted science or art project, but a simple and straightforward dish done with no smoke or mirrors. It’s a slowly braised piece of pork—cooked until it nearly falls apart just by looking at it, with white beans and kale in a luscious, natural, braised tomato jus. This is the type of home-style cooking that you really want to share with someone—perhaps the stranger seated next to you.